Girl Guides Victoria has developed a secure social media site similar to Facebook aimed at the under 13s who are too young for traditional social media applications. And the organisation claims the secure site called iGGi (i Girl Guide Interactive), provides a platform for young people to learn to interact through social media in a completely protected environment. 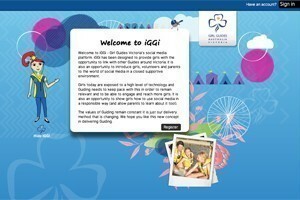 iGGi was developed by Boston-based Imran Sayeed, the Chief Technology Officer at NTT DATA, in conjunction with Girl Guides Victoria. Sayeed was recently recognised as a 2013 Premier 100 IT Leader by Computerworld. Sayeed described iGGi as a “one-of-its-kind social media platform for the excluded”. “We were looking to develop a platform that can provide a social media experience in a completely secure environment,” he said. Girl Guides Victoria CEO, Wendy Lewis, said: “We believe that in today’s society, social media plays an important role, and as part of developing life skills, we have a role to play in informing girls and young women about how to use social media in a responsible way. “These girls can now learn how to communicate appropriately and at the same time, share their passions and interests with other Guides,” Lewis said. Robinette Emonson, State Commissioner for Girl Guides Victoria, believes the new platform will help bring girls from across the state closer together, both online and in real life. iGGi utilises blogs, message boards, chat, and “The Wire”, a Twitter equivalent to send messages. The entire site is completely secure and requires acceptance of a social media agreement which sets out what’s expected of all users. Congratulations on this wonderful initiive Girl Guides Victoria! It is great to see an organisation that has been providing opportunities for girs for over a century, to now be so future focused and doing so online.